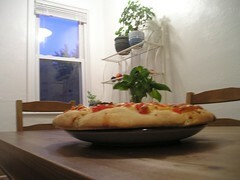 I made this pizza last night. It’s the first time I made a pizza completely from scratch. The results were very good, and the pizza was very large. I used organic garlic and tomatoes for the sauce, and topped it with basil (from my garden) and mozzarella. these posts…very helpful indeed. looks like you guys have been doing to some really interesting work. wish i could have joined you guys.anyways…i get into pitt 9th aug. see you soon and keep blogging! Greetings and salutations Jamin. I see you’re not a starving graduate student. Pizza looks good. Seems like you’re learning a lot from your classes. I wish you much success.